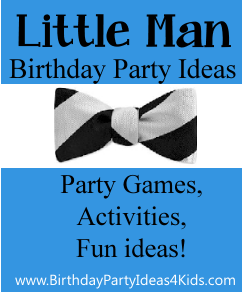 The Little Man birthday party theme is perfect for young boys and especially fun for a 1st birthday party theme. These party ideas will make the Little Man party something to remember. Make invitations out of blue note cards by cutting out either a tie or bowtie from scrapbook paper and gluing to the front of the note card. If you use a bow tie you can also glue 3 or 4 white buttons underneath the bowtie in a vertical line. Cut out shapes of mustaches, bowties, long ties or dress shirts and paste to the front of note cards. Make or buy note cards that have a tuxedo pattern on the front. Hang ties and/or bowties from chandeliers, the mantle, staircases and entryways. Make a banner using long ties draped over a cord and gluing the letters of your little man's name to each tie. Or make a paper banner using scrapbook paper in tie patterns. Or make a cute banner using triangles and paper mustaches glued to the center of each triangle. 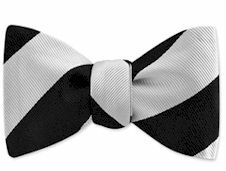 Set out a table full of bowties and regular ties and ask guests to wear them during the party. A piece of string attached to each side of a bowtie will make it easy to wear as a necklace. For the birthday boy and his guests make an easy tie appliqué t-shirt for them to wear. You will need Heat and Bond, a t-shirt and some fabric. Following the directions on the Heat and Bond iron the fabric and the Heat and Bond together. On the Heat and Bond side trace a bowtie or regular tie pattern and cut out. Peel off the back of the Heat and Bond paper, place the tie on the t-shirt and iron. Very easy and fun to give as a party favor! Decorate tables with bright blues, greens and oranges or make it subtle and use old chambray shirts sewed together as a table runner. Place snacks and food in dishes and then place inside men's hats such as a fedora or top hat. Dress up food tall food containers by cutting off a sleeve from a man's shirt and setting the container inside it. Cut out paper mustaches and glue to party hats. See the party games pages for 1st birthday party games and games for 2,3 & 4 year olds. Serve large pretzel sticks in a cigar box. Serve bowtie shaped food by cutting out two triangles and placing them together at the point of the triangles to make a bowtie shape. Cut out bowties from sandwiches, fruit, brownies and cookies. Serve bowtie pasta with different sauces. Set out bottles of root beer in a large tub on ice. Make a candy table full of different types of candies that match your birthday theme colors. Use different sizes and shapes of jars and bowls. Make a Bar-B-Q style cake for everyone to enjoy. Dress up water bottles with small bowties, mustaches or regular ties. Bubbles - attach a small bowtie or mustache to each bottle with hot glue. Chocolate mustaches or ties - buy a candy mold and make your own. Fill glass jars with uncooked bowtie pasta and tie a ribbon or raffia around the top right under the lid. Decorate plain brown bags by gluing on a tie or bowtie made of scrapbook paper or fabric. Place party favors in different types of men's hats. Tie up favors in chambray fabric and tie with a white ribbon or raffia. See our 1st birthday party ideas for fun ideas and activities for your little man and the first birthday.